I am on the fence about 3-week manicures. I’ve sworn off them in the past, but the temptation (and novelty) of having shiny, glossy and groomed fingertips that last is sometimes more than I can bear. So I pushed my reservations aside when A|wear invited me along to their new nail bar, SugarDolls. 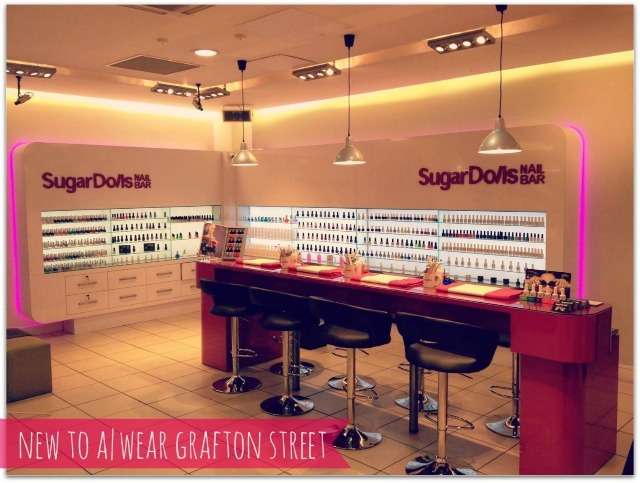 Located in the basement of A|wear on Grafton Street, it offers Gelish and Shellac along with acrylics, nail art (at a euro a nail), standard file & paints as well as various brow and lash treatments – and all at very reasonable prices. As goldish greens are taking centre stage this autumn I went for a lovely foresty variation, shot through with sparkle. The colour is definitely a hit – I’ve never had as many compliments – and my nails look neat and tidy too, having been buffed, shaped and trimmed around the cuticles before the colour was applied. An unexpected bonus – the result of a new bottle of Shellac – is the slightly graduated colour result; my nails look darker at the tips than at the beds, and I’m digging the subtle, ombre effect. It’s been on a week and looks as fresh as when it was applied. I catch myself admiring my hands, and feel generally more put together, which is really rather nice. A Shellac manicure costs €30 at SugarDolls; Fluff and Fripperies was a guest of A|wear. What a gorgeous colour, the slight ombre is fab! Love how glossy your nails look too. Great addition to Awear also. I'm just not sure about 3weeks though I change my colour about twice a week !! Maybe for holidays or coming up to Christmas party season. Gorgeous colour and am loving the ombre effect! I love how shiny it looks! I feel more confident when I have a nice manicure, so if it really last three weeks, it's worth it! Class colour, and I love the ombre effect. I'm getting Shellac done this evening, can't wait. A mani that last 3 weeks would be amazing! That color is gorg! I love the name of their shop! Too cute! Wow, a mani that lasts 3 weeks? Someone has answered our prayers. HAHAHAHA Looks good after 1.
perfect Emma, and the color will be one of the best for the next season! What a beautiful and lush green shade! I know what you mean, sometimes I give in to the temptation of a 3 weeks mani. This in particular is so glam Emma!! Beautiful Autumn nail colour Emma! They look so glossy and I love the unintentional ombré effect too. You've inspired me to get out my green polishes! Thanks for visiting my blog! Your nails are amazing!